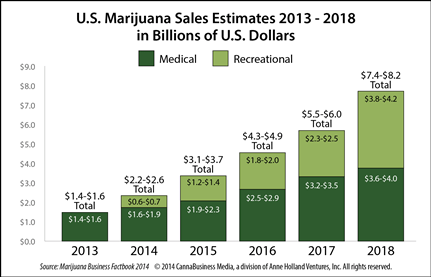 U.S. retail cannabis sales will rise more than five-fold over the next five years, from an estimated $2.2-$2.6 billion in 2014 to $7.4-8.2 billion in 2018, according to new financial data released today in the 2014 edition of the Marijuana Business Factbook. Although the 2014 estimated sales are right in line with predictions from last year’s edition of the Factbook, the 2018 forecast has risen by roughly $2 billion. This lift is largely due to the impact of last August’s Cole Memorandum wherein the federal Department of Justice stated it would take a hands-off approach to the cannabis industry as long as companies obey local laws and state regulations and oversight are strict. 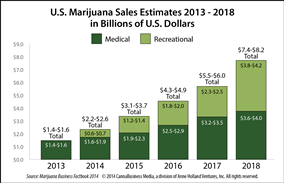 The sales estimates include both medical marijuana and recreational cannabis sales, and account for additional states establishing and launching cannabis sales programs during the time span covered by the forecast. These predictions assume 4-5 new recreational states and 2-3 medical cannabis states will have fully-functional programs by 2018. Recreational cannabis sales are only legal in two states currently. According to estimates, 2018 is anticipated to be the first year that recreational sales match or even overtake MMJ sales in the U.S. This data does not include black market sales. However, other research indicates that despite prior industry fears, the majority of cannabis consumers are willing to switch from black market providers when cannabis is legally available in their regions. The U.S. black market is currently estimated to be in the $40 billion range. Thus, the legal marketplace has significant potential beyond 2018. Very few MMJ states release data on cannabis sales (or even track it.) Only a tiny slice of cannabusinesses release their financials for public scrutiny. 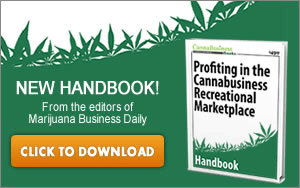 The editors of the Marijuana Business Factbook 2014 used a wide variety of methodologies to create the sales forecasts. Sources include exclusive surveys of both cannabis consumers and cannabusiness executives, as well as statistics and political analysis reported in Marijuana Business Daily and its sister publication, CannaBusiness Magazine. …interesting that the forecast does not include industrial hemp. I would think that the prediction could easily double, considering the multi-faceted uses of iHemp. The use of hemp as a biofuel fuel alone deserves serious consideration. But this is indeed a great start and as the article states, it may be a conservative estimate. Hemp will be very important for this vertical’s forecast. There are companies out there such as Stevia Corp. who are at the forefront of this and will soon be spearheading health food/care products with respect to hemp. Also, it should be noted that the CBD is most definately extractable and will help the medical industry. How ’bout $8 for the folks making this happen right now? Has anyone given a thought to as what the New York state market would be?? I have done some preliminary work and have a figure of $1.06Billion just in the MMJ side! email me for my report if you would like to read it!